Brite Line Paint Co. Inc. - Handicap Sign Installation | Brite Line Paint Co. Inc.
Brite Line Paint Co., Inc. can also install handicap signs for our clients, providing proper markings and designations for ADA compliant parking spaces to commercial parking lots. 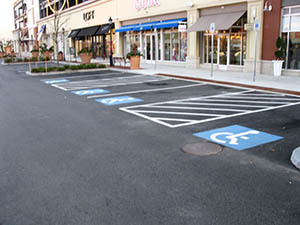 Once your parking lot layout has been designed and your commercial parking lot is stripe and seal coated by our crew, it is important to ensure that proper handicap sign installation and other specialty pavement markings for handicap parking are in place. Our team of experienced installers can help determine what type of handicap sign installation is required for commercial parking lots in order to meet Americans with Disabilities Act regulations and requirements. Not only will Brite Line Paint’s services help you to stay in compliance with the ADA, but they will also help you adhere to any local ordinances, state laws and federal guidelines with regard to parking for disabled visitors, as well as zones for fire, loading, unloading and emergency services. To find out more about the handicap sign installation and other ADA services provided by Brite Line Paint Co., Inc., use our online contact form or call our local office at (508) 678-6775. 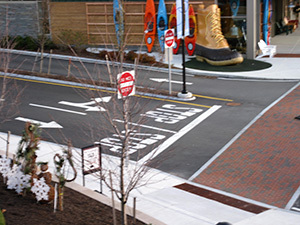 We provide commercial parking lot layouts, ADA compliant pavement markings and handicap sign installation in addition to our parking lot striping and re-striping services to customers throughout Massachusetts and Rhode Island, as well as New Hampshire, Vermont, Maine and Connecticut.